Yesterday, Executive Director of the School of Fashion, Gladys Perint Palmer, shared her insights and illustrations from the 2013 Paris Haute Couture Shows with University students. Gladys, having just returned from the collections, presented highlights from designer shows including Oscar de la Renta, Christian Dior and Chanel, along with her illustrations capturing a few celebrity sightings from the front row ranging from Anna Dello Russo to Kimye. Post-presentation, Gladys treated students to an illustration workshop featuring a live performance installation by Anastazia Louise of Bad Unkl Sista. 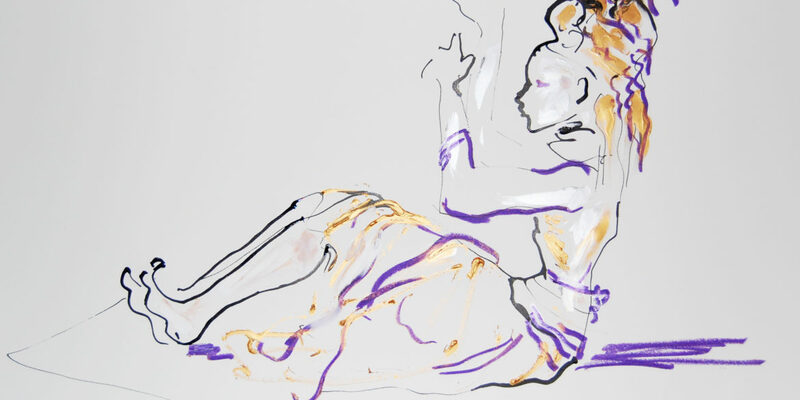 Dressed in dramatic costume, Anastazia’s poses were not only captured in Gladys’ sketches, but also streamed live so students across the world could witness the performance and study Gladys’ expertise. One of the longest live drawing demonstrations of the fashion illustrator’s career, Gladys produced several one of a kind works in both indian ink and pastels by the end of the event along with an invaluable education and experience for all who tuned in. In addition to the inspiring performances and images from yesterday’s event, we’ve included select sketches from the students who attended to share with you.